52 Ancestors, No. 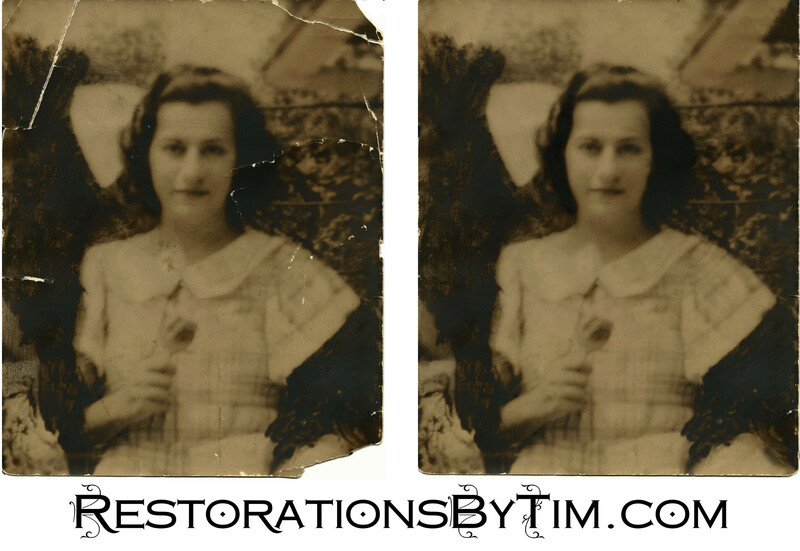 26: Aunt Ceil, and the Life of a Family Photo | Photo Restorations by Tim G.
As a young girl, my mother discovered in a closet a plaque that eerily bore her own name, Celia Anflick, along with birth and death dates. It was a metal plaque that my mother described as the sort of thing one might see hung in a mausoleum. Of course, the plaque was not my mother’s memorial from a past life. Rather, it was a memorial to an aunt whom my mother would never meet. Later on, my mother would salvage the photo above from among the possessions of her Aunt Rose, who had lived with my mother’s family for a short time and kept a lot of sundries there. My mother kept the photo in a special place because she appreciated having a relative who shared her name. The name Celia is actually common, traditional name for girls in my mother’s family. In addition to his sister, my grandfather had two cousins who went by that name. My grandfather kept this tradition by naming my mother Celia, but he always called her by her full given name, Celia Ellen. Nobody called my mother Ceil until she met my father, who called her by that name. In my mother’s childhood household, the name Ceil referred to Aunt Ceil, that is, my grandfather’s sister. The Celias of generations past kept Simbria as a Hebrew name, and this Ceil appears that way in the 1920 census and also in her father’s naturalization papers. 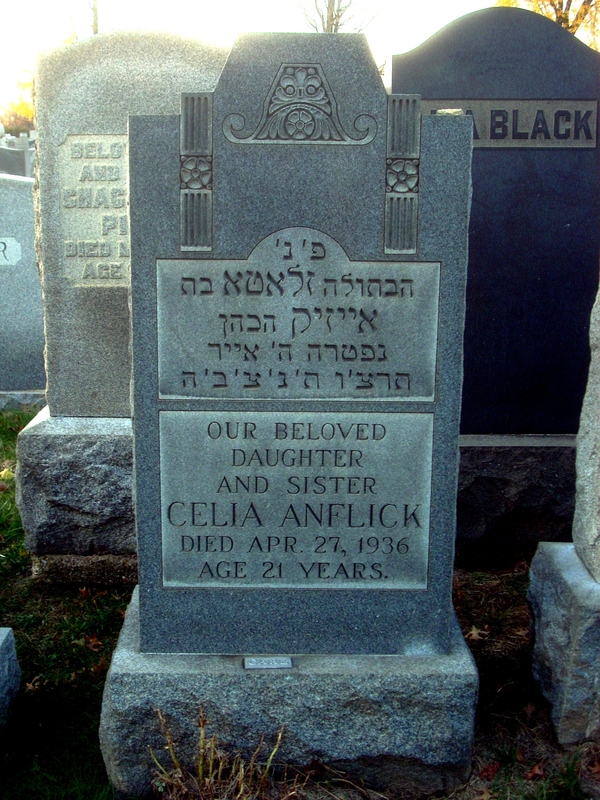 Inexplicably, Ceil’s name appears as Lottie on her birth certificate, and, in Hebrew, as Zlata on her gravestone monument. I believe this is now the only picture I’ve seen of Aunt Ceil, although my mother’s cousin, Melodee, might have others. Like many Anflick family photos I’ve seen, this photo was at one time glued into a photo album of black pages and later torn from that album by unknown agents. 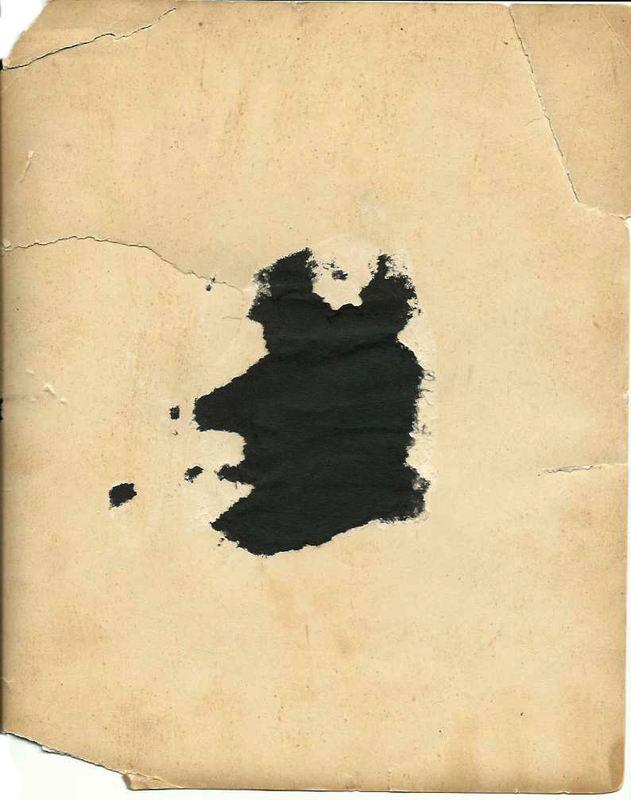 I suspect that some of the damage to the photo resulted from that trauma, and remnants of the black paper remain on the back of the photo. The ravaged and unbound remains of that album are now in a tin box Melodee’s possession. I imagine that the album was compiled while my grandfather’s family was all together. As siblings moved away, I imagine they each took parts of the album with them. As my grandfather’s siblings each passed on, I imagine many of the photos have reverted to that album. The result of this imagined process is a tin box containing a tattered photo album together with a plethora of loose, well-loved, and well-traveled family photos, many with glue and bits of black paper on the back. A common sight on the backs of Anflick family photos. Aunt Rose ostensibly claimed the photo of Ceil above, which remained in my mother’s possession and therefore never reverted to the album. The photo appears to have been manipulated in two separate events. First, Ceil is swaddled in a splotchiness that obscures both of her arms. Although it looks to me like someone carelessly slathered dark paint on the photo, those splotches are, in fact, a part of the print. I have no idea who arranged that, or how, or why. I may in the future attempt to restore arms of some kind to this photo, but that risks potentially misrepresenting history. Legend has it that Deborah’s rural Burlington County location was key to recovery because of therapeutic pine barren air. In reality, thousands of TB patients were medically treated and successfully cured by Deborah physicians. Her disease was called consumption on account of its tendency to consume its victims. The result is often an emaciated look that you can see illustrated here. I hear that the photo above may have been taken while Ceil was in treatment at the sanitarium. I can’t know, but the splotches might have been placed intentionally to hide an unhealthy appearance. Although she spent most of her time in treatment at the Deborah Sanitarium in New Jersey, Ceil returned to Philadelphia for her final days. She died at Philadelphia general Hospital at the age of twenty-one on the April 26, 1936. She is buried at Montifiore Cemetery in Rockledge. Beyond the splotches, the photo had been drawn upon with pencil by another unknown agent, possibly Aunt Rose. The original photograph is quite blurry, and the pencil marks add detail in some places, such as the spaces between Ceil’s fingers and the pupils of her eyes. I left these added details in my restoration. In other places, the pencil marks serve no apparent purpose. On the left side of the picture, for example, some lighter portions of the picture had been colored in dark. I removed these markings when I could. I don’t know much about Aunt Ceil’s personality. My mother said that her father would never talk about her. He was thirteen years old when Ceil died. My mother’s Aunt Perri was two years younger than my grandfather. According to my mother’s cousin, Melodee, Perri remembered Ceil dancing around the house in a top hat, so it seems like Ceil had some of the Anflick performers’ genes. My mother told me that her father had a compulsion toward killing germs. This might have resulted from losing Ceil and another older sibling, Albert, to tuberculosis. My grandfather would bathe at least twice a day, and often three. He insisted on opening the window curtains and shades all the time, to promote good health by letting as much sunlight as possible into the house. Lastly, he sternly admonished his children to get their faces off of the floor when laying around the house. To this day my mother gets perturbed when my nieces and nephew lay on the floor with their faces on it. Get your faces off the floor, kids! Celia’s monument at Montefiore Cemetery. The Hebrew text reads: Here lies Miss Zlata, daughter of Isaac, died on the day [Hebrew date]. may her soul be bound up in the bond of eternal life (abbreviated). Many thanks to my mother and cousin Melodee for the photographs and memories, and also to Miss Ariel Gornizky for her help translating the monument. the history of the scrap book is not quite as good a story as you imagined. My mother kept that book from the time she was a child. It was destroyed by someone I no longer have contact with who took it apart to videotape it, and carelessly gave it back to me in pieces. My mother was not happy and neither was I… thus the tin to keep the pieces together. I like my imagination better. Furthermore, my uncle Ishaq clarified over the telephone that Sembria is more likely a variant of a Ukranian regional name with origins in the Cimmerians. I didn’t quite catch how he discovered that nugget, but he’ll let me know, I’m sure. It makes sense, because Zlata is surely a Hebrew name. That name is, after all, written in Hebrew on her gravestone. So let’s say this: Zlata was her Hebrew name, Sembria was her Ukranian name, and Celia was her american name. Got it?